Rent this Cordoba D11 for only $10.85 per week through Studio 19. The D11 dreadnought features all solid acacia for the back and sides which give it a clear, bright tone, and distinctive figured appearance. The D11 also features a solid Sitka spruce top along with a beautiful ebony fingerboard and rosewood bridge and binding. The styling is refined and sleek, using acacia wood on the double ring rosette and 12th fret fingerboard inlays, capped off with Cordoba’s signature elevated headstock with an acacia strip and Mother of Pearl inlay. The finish is a thinly applied high gloss polyurethane. 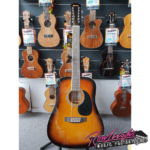 Other features include a TUSQ® nut and saddle, gold Grover tuners, Elixir® NANOWEB® Light Gauge (.012-.053) strings, and a Cordoba deluxe archtop wood case with built in HumiCase™ humidification.